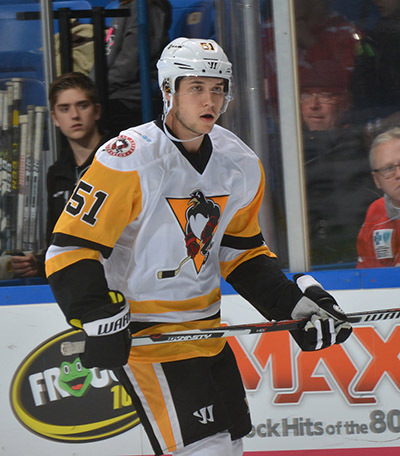 Derrick Pouliot’s goal at 7:49 of overtime was the difference, as the Wilkes-Barre/Scranton Penguins won a thriller, 6-5, over the Providence Bruins on Sunday afternoon at the Dunkin’ Donuts Center. Pouliot picked up a loose puck and skated through the neutral zone, banking a shot off of the back of goaltender Zane McIntyre to even the best-of-five series 1-1. Game Three is scheduled for Thursday night back in Wilkes-Barre. The Penguins at one point held a 3-0 lead, only to see the Bruins chip away and finally take a late one-goal advantage. But an extra attacker goal from Josh Archibald forced overtime and Pouliot’s fantastic individual effort gave Wilkes-Barre/Scranton the split on the road. The Penguins controlled much of the play in the early going, outshooting the Bruins 18-9 in the first period, but couldn’t beat netminder Zane McIntyre during the opening frame. That changed quickly in an offense-filled second period. Chris Casto’s errant clear found it’s way into the stands, giving Wilkes-Barre/Scranton a power play just 20 seconds into the middle period. Warsofsky made sure the opportunity wasn’t wasted with a blast from the point which opened the scoring for the Pens. The former Bruins defenseman made it a 2-0 contest just 23 seconds later with another shot from the near boards. Wilkes-Barre/Scranton captain Tom Kostopoulos was sprung from the penalty box after an interference call and corralled a Penguins clear in the Providence zone. He then fed Tom Sestito at the far post, and Sestito deposited the puck in the net to make it a 3-0 game. Chris Porter got the Bruins on the board 14 seconds after Sestito’s goal, as the teams played four-on-four hockey after offsetting roughing minors to Sestito and Tyler Randell were handed out. Porter picked up his second of the night at 17:11, banging in a loose puck from a scrum in front of the Pens’ net. And Tommy Cross, recently reassigned from the Boston Bruins, went top shelf from the right face-off circle with 1:46 left in the period. The Penguins went back in front when Josh Archibald picked up his first of the playoffs at 3:58 of the third period. But Danton Heinen notched his second of the series as a Tom Sestito hooking penalty was about to expire at 7:38 to tie the game, before Peter Mueller picked up a loose puck in a scrum and beat DeSmith at 12:48. With time running down, the Pens pulled DeSmith for the extra attacker, and the move paid off as Archibald’s shot deflected off a skate and into the Bruins net with 1:03 left in regulation to force overtime. DeSmith stopped 28 shots to pick up the victory for the Penguins, while McIntyre made 38 saves in the loss. The best-of-five series now moves to Wilkes-Barre where the Penguins will play host to the Bruins in Game Three on Thursday night at 7:05pm. Individual tickets for Thursday night’s game are available at the Mohegan Sun Arena box office, online at TicketMaster.com, or by calling 570-208-7367.